We're nearing the end of the season for Nantucket Bay scallops. Why not have an easy dinner tonight and served with a delicious tomato, garlic and lemon mixture? 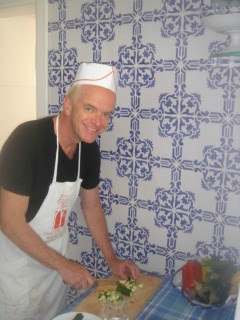 As always, be your own sous chef and have everything chopped and ready to go before you start cooking. Slice some cherry tomatoes, smash some garlic and saute them in a separate small pan with extra virgin olive oil. Stir often. You can start these cooking before you start the scallops. Cook the cherry tomatoes first. Garlic can burn very quickly so wait until the tomatoes are well underway before adding the garlic. Eyeball them - once they're cooked after about 5 minutes turn heat down low to keep them warm while the scallops finish cooking. Meanwhile, take your bay scallops and dry them with paper towels. Heat a non-stick pan over medium heat. Add extra virgin olive oil and a pad of butter. Lightly fry the scallops and as they start to brown toss in some more chopped garlic. They should cook in 2 - 4 minutes. When you get to minute 3, add champagne vinegar. They make the scallops taste more like scallops! Squeeze fresh lemon juice over the scallops just as they're about to finish cooking. Step back! The lemon juice and the champagne vinegar will cause the pan to sizzle. Just because you're exhausted after a busy week doesn't mean you can't have an elegant yet easy to cook dinner. Take advantage of these lovely morsels before they go out of season. Nuts: Protein Helps Quell Hunger Pangs and are Good for You! I don't mean this theory is nuts - just that nuts contain the proteins and other healthy things to calm down food cravings, while being good for you at the same time. I did a posting on what I have for breakfast a few weeks back - in the colder months I like to have hot oatmeal (even the skim milk is hot). And while a hardy bowl of cold or hot cereal is a good way to start the day, I have a handful of almonds or peanuts after my workout each morning. Without this protein, I don't think the bowl of cereal would carry me through the morning and early afternoon. Protein comes from the Greek word protos meaning "first." Your body uses proteins in your diet to build new cells, maintain tissues, and sythesize new proteins to help your body perform basic functions. That handful of almonds, or peanuts, or whatever your favorite may be (pistachios anyone?) is good for you and, at least in my case, helps me feel full and satisfied. After all, I tend to go for salads and soup for lunch. Usually I have a vegetable soup like split pea or tomato basil. Without the dose of protein I would crash and burn by 4 PM. Speaking of soup - Lentil Soup is also an excellent source of protein. Besides helping you feel sated, nuts are good for you. 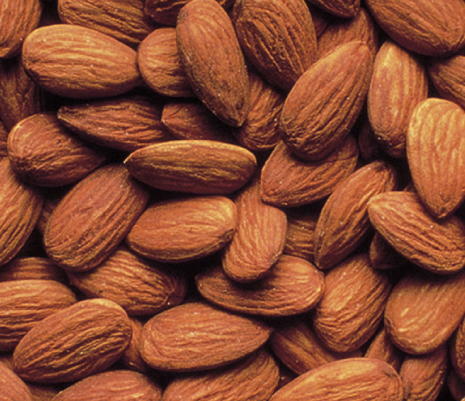 Almonds are low in saturated fat and contain my other protective nutrients - calcum and magnesium - for strong bones, vitamin E and may help protect against cardiovacular disease and even cancer. There is reduced heart attack risk when you have nuts five times a week accord to a Loma Linda School of Public Health study. 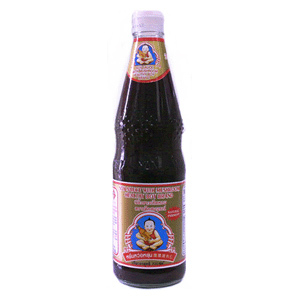 They help lower cholesterol and can have the anti-inflammatory agent found in red wines. The fat in nuts is unsturated, or the "good" fat and there is no cholesterol in these fats. As you know, I avoid fats at all costs. But all fats are not created equal. The American Heart Association rescently eased up on its recommendation that no more than 30 percent of our calories come from fat. 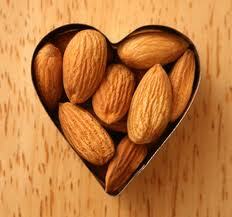 They now say addtional fat is OK, so long as it's unsaturated - like the good fat found in almonds. I do try to restrict my almond and other nut intake to about a handful or so every day. Try some after your breakfast tomorrow and see if you notice less of an appetite, and less of a desire to snack before lunch. Or if you crash and burn at 4 PM, try nuts with some raisins instead of cookies or candy to go with your coffee. So, while some of my gentle readers may consider me nuts - there's nothing nutty about the benefits of almonds! One of the things I enjoy about this blog is trying out things I've never tasted before. I have never had tilefish and wasn't really interested in trying it. I pictured a fish that looked like linoleum! But I was at the fish monger and saw that it's a sturdy fish. The filets were cut thicker than other fish like flounder or sole. I planned to steam the filet and I wanted something that would stand up to the steaming process and would absorb and not compete with the flavors I'd be cooking with. The first night I experimented with tilefish I used some strong flavors including Sriracha and Teryaki sauce. I enveloped the filet in fresh basil, lemons and tomatoes. It was very tasty but I wanted to try it with subtler flavors as well. So the next night I tried it again, but this time using only basil, lemon, tomato and a hint of cilantro. A little more background on tilefish: they come primarily from the Gulf of Mexico and the southeastern seaboard. They don't swim in schools, but cluster near the heads or sides of submarine canyons. So, when you buy tilefish in NYC they're not from Montauk! The filets I had were very fresh though. Consider the branzino I'm so crazy about come from the Mediterranean. And tilefish is a good deal - about $14 per pound at Citarella. I liked the tilefish both ways, but if I had to choose I'd go with the simpler preparation. I'm listing all of the ingredients below and you can decide which version works best for you. I've been all about roasting vegetables lately. Over the years I've boiled, sauteed and lately came upon roasting them. Not only is it no-muss, no-fuss, it's delicious. If you read this blog regularly, you know that I only buy fresh ingredients - to the point that I shop each day for that evening's food. And in NYC there are farmers' markets galore and plenty of outlets for fresh vegetables. But I only buy frozen artichokes. Call me lazy, but I don't want to wrestle with a fresh artichoke. 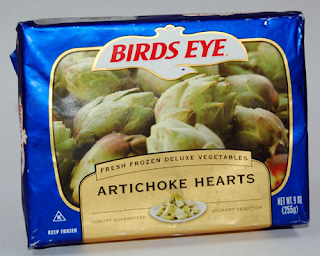 I buy Birds Eye frozen artichokes. They are a bit on the pricey side, coming in at around $4.50 for a package. But in my opinion, it's worth paying a little bit more to avoid the chore of preparing the artichokes yourself. First, I leave the package of frozen artichokes on the kitchen counter for the afternoon to defrost. When I get home from work I take them from the package and wrap them in paper towels - they're pretty soggy at this point. Soggy veggies don't char well! At this point, the procedure is the same for roasting all other vegetables. Place them in an oven-proof, non-stick pan (I use my Le Creuset skillet). Cover with 1 to 2 tablespoons extra virgin olive oil (less is more - you don't want oily veggies). With the artichokes, I roast them for a shorter period of time - 10 - 12 minutes at 425 degrees. Flip them half way through and keep your eye on them - they burn in a second. I added cherry tomatoes and lemon to make the dish attractive - but the tomatoes taste great, too and the lemon flavor seeps into the dish.